Barbizon Lighting Company Blog: JR Clancy T-Shirt Supports "Behind the Scenes"
JR Clancy T-Shirt Supports "Behind the Scenes"
Far too many people in the entertainment industry have no health coverage or minimal health coverage. "Behind the Scenes" is a charity providing financial support to entertainment technology industry professionals when they are ill or injured. 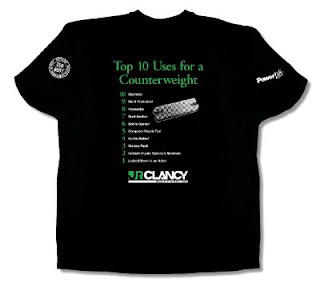 We're pleased to offer our "Top 10 Uses for a Counterweight" T-shirt to help support this charity. For $15 you'll receive a black, 50/50 cotton poly blend T-shirt, with the proceeds going to "Behind the Scenes". The shirts are available in M, L, XL and XXL sizes. To order T-shirts, call Jody Pennisi at 315.451.3440 or 800.836.1885, or e-mail jodypennisi@jrclancy.com.